The Call-A-Head Corporation never fails to expand on its ideas and creations. This proves to be true with our newest production, The Portashed 48. The Portashed 48 is a large, secure, portable shed with 336 cubic feet of organized space. The Portashed 48 was designed exclusively from Call-A-Head with solely our customers in mind, using only the highest quality products with strong & durable aluminum & fiberglass construction built to last a lifetime. Complete with heat, lights & electric, the Portashed 48 exceeds any & all expectations required of a utility storage unit. Its all gel-coat fiberglass & aluminum surfaces make for easy cleaning with absolutely no corrosion, and its bright white color gives off a spacious, clean feeling. The Portashed 48 is topped with a single mold fiberglass roof creating a completely weather tight shed. These units keep your expensive tools & equipment closest to where you need them, while keeping them perfectly stored & secured. The Portashed 48 comes fully equipped with a commercial steel fireproof door & a 5 point Call-A-Head locking system, offering maximum protection for your valuable assets. Being one of the only companies in the industry offering same day delivery, Call-A-Head gives our customers the ability to take advantage of our always fast & efficient services. With just one quick phone call, your Portashed 48 can be easily moved from job-site to job-site for your convenience. It’s innovative design, quality construction & versatility make it the ideal solution when you need a secure, portable space. 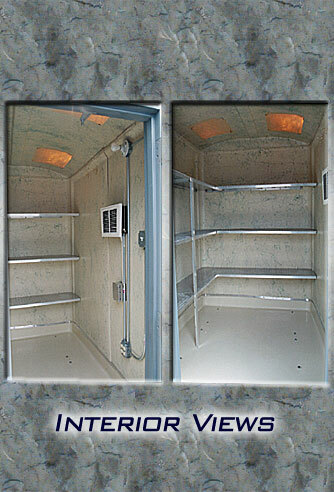 Once you’ve examined & compared our units firsthand, we’re convinced you’ll find Call-A-Head quality unsurpassed. 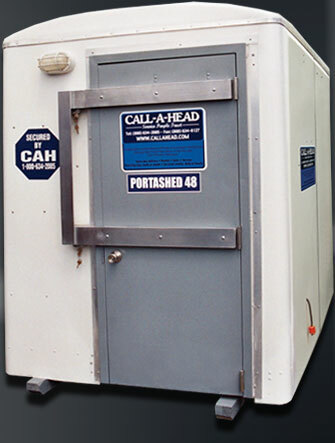 When secure storage matters, Call-A-Head for your Portashed 48 today. DOOR OPENING - 30" X 72"